When the Victorian mountaineer Edward Whymper visited Ecuador in 1879 – ostensibly to study the effects of high altitude, but in reality to polish off a few first ascents in the High Andes – he was far from impressed. 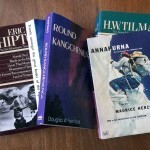 In his book about the expedition Travels Amongst the Great Andes of the Equator, he’s quite derogatory about the scenery, describing it as “hilly” rather than mountainous, and dismissing a couple of mountains as beneath contempt because it was possible to ride a donkey to the top of them. But Whymper is best remembered for making the first ascent of the Matterhorn in the Swiss Alps in 1865, a mountain which until then had been considered too difficult to climb, and even today is the ultimate ambition of many a rock climber. When I visited Ecuador myself in 2009 I carried a copy of his book with me, and concluded that he must have been viewing the scenery through a climber’s blinkered glasses, for I found the scenery beautiful, and really enjoyed the climbing. While it’s true that Ecuador possesses nothing as technical as the Matterhorn, it provides a variety of mountains of differing degrees of difficulty, and if like me your motivation for climbing is to admire the scenery as much as challenge your abilities then you won’t be disappointed. In fact, in my opinion it’s a great training ground for anyone who wants to learn the basics of mountaineering in an interesting setting. Here’s why. 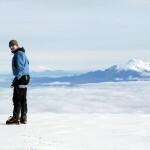 Hill walkers will love Ecuador’s Central Highlands. Its mountains, all volcanoes, stand apart from each other like beacons across the high altitude paramo grasslands. It reminds me a lot of Sutherland in Scotland, where the hills are spread out across great distances, enabling you to see for miles from the top of each one. Some, such as Pasochoa and Atacatzo, are nothing more than hill walks. Then there are those which require a degree of scrambling from easy to hard to verging on a rock climb. 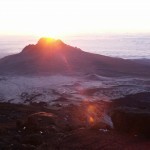 Pichincha, Rumiñahui and the Ilinizas are all scrambles of various levels of difficulty. 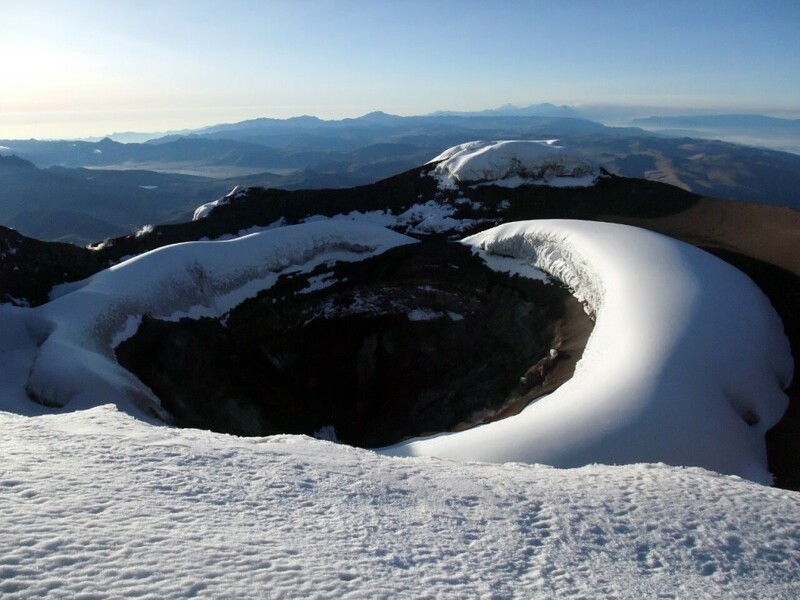 Then there are the big four glaciated volcanoes: Chimborazo (6310m), Cotopaxi (5897m), Cayambe (5790m) and Antisana (5753m). These require mountaineering skills such as ropework, and using ice axe and crampons, though none of them are particularly hard, and the necessary skills can easily be learned on the mountains themselves. 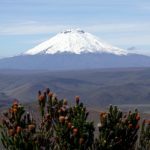 Ecuador’s volcanoes provide a good opportunity to reach a very high altitude with a reduced risk of altitude sickness because it’s very easy to acclimatise in comfort. Ecuador’s capital Quito lies at an altitude of 2850m, so you begin acclimatising as soon as you arrive, and every day spent resting in the Central Highlands helps a little more. You can get to 4000m on the cable car above the city and do day walks on some of the smaller volcanoes such as Pichincha and Pasochoa to aid acclimatisation before tackling the big ones. There are many mountainous places in the world where guided climbing is difficult because the local guides, while they may have excellent knowledge of the local area, are not best equipped to lead you up a technical climb. Ecuador is not one of these places, for there are plenty of highly skilled mountain guides, some of whom are even UIAGM qualified. 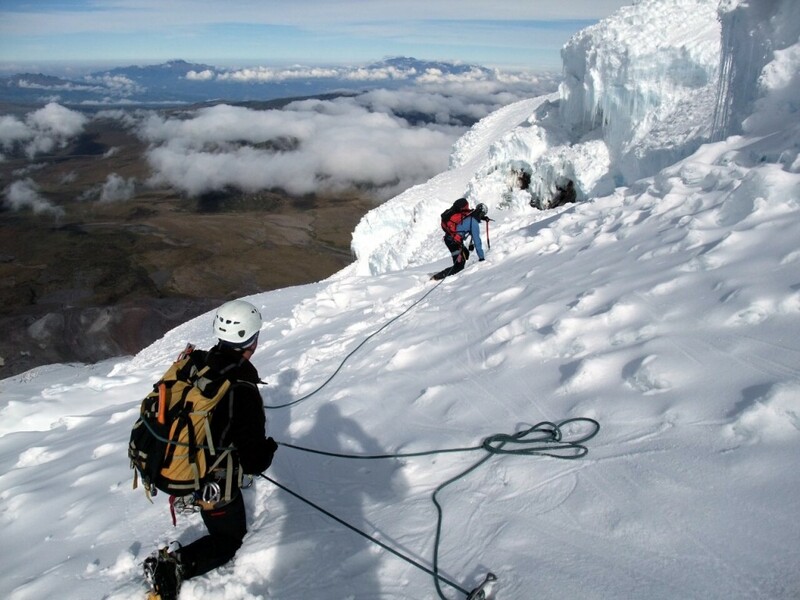 If you arrive in Quito with little mountaineering experience but are keen to climb Cotopaxi, then it’s possible to hire someone reliable to provide the necessary instruction and logistics to get you to the top. 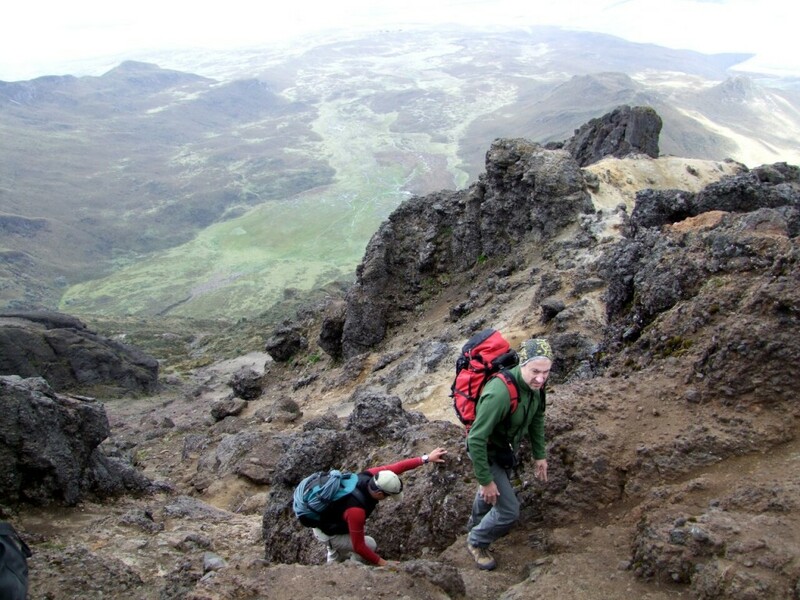 If you’re not too keen on some of the hardier aspects of high altitude mountaineering, such as multi-day treks, remote camping, squat toilets and (perish the thought) having to stay tee-total for many days, then you have little to fear from Ecuador. Everything is accessible by road, and the climbs are never more than day hikes, or at worst two-day jaunts involving a single night of camping or stay in a mountain hut. In between mountains you can stay in pleasant lodges and haciendas with stunning mountain views, fine wine and lovely big juicy steaks. It’s as luxury a mountaineering holiday as you’ll find anywhere outside the Alps or Rockies. Let’s remember why we’re doing it. For some of you it may be all about ticking boxes or getting an adrenaline buzz from putting yourself in a situation where you’re climbing at the limits of your ability. This is fine, but if this is your only motivation then you’re missing out on much of what’s magical about mountains: the stillness and the scenery. Whymper thought Ecuador was “hilly”, and for him this was a bad thing. I disagree. There are some beautiful hills, and Ecuador’s volcanoes are among the finest. From the summit of any you can see most of the others stretching for miles all around you. Staring down into the volcanic crater of Cotopaxi is an image that will always be with me, as will crossing the remote paramo grasslands to high camp on Antisana. Some, such as Sangay and Tungurahua, are still erupting, and Whymper never saw that from the Matterhorn. And if you need more convincing, I invite you to read my travel diary In the Footsteps of Whymper to give you a taste of what an Ecuadorian mountaineering holiday is like. 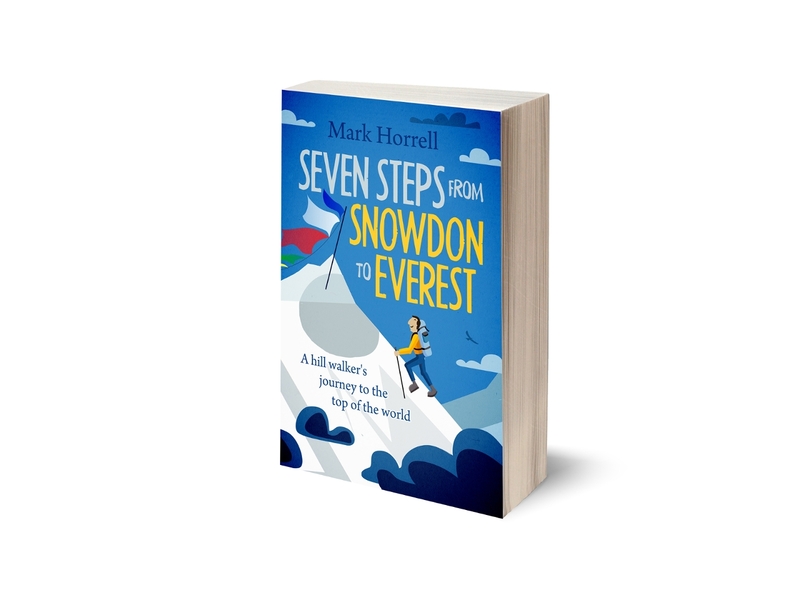 If you have a Kindle I’ve even recently made it available as an e-book.